There was a time I was afraid to become a mother. And then we got pregnant. I was going to be a mom. The thing I wanted the most was also the thing that terrified me to my core. What if I wasn’t ready to become a mother? What if I was just as socially awkward with my own child? What if I tried to talk about the weather or politics? What if I couldn’t figure out what to do? These thoughts plagued me my entire pregnancy as I read every book I could get my hands on. How to sleep train. How to breastfeed. How to be more French. How to raise kids that will become world leaders someday. I so desperately wanted to be prepared. Then, ready or not, I went into labor. Two years ago today, Dairy Man and I woke up in a hospital room (after five blissful hours of sleep thanks to the modern miracle of an epidural), feeling woefully unprepared for what was to come. But he was born. Anders Knox. Pink-skinned, blue-eyed, and boasting an impressive set of lungs. From the first moment he was placed on my chest I felt the heavy weight of love. I didn’t love him because he was a baby. I loved him because he was my baby. This love was instinctual, carnal. In those first few weeks of sleep deprivation, diaper explosions, and constant fear of doing things wrong, this love sustained me. This love kept me moving forward. Today my sweet boy is two. He has a personality and independence. He talks constantly and is obsessed with farm equipment. He is very particular about his shoes. He isn’t afraid of cows and gives the biggest hugs. I’m starting to realize that I’ve gone beyond loving him just because he’s my son to loving the person he is becoming. I feel it when he clearly articulates which stuffed animals he wants in his crib. I feel it when he races ahead of me to say hi to the baby cows. And when I have to keep him from climbing under the fence to pet them. I feel it when I ask him what he wants for breakfast. Or lunch. Or dinner. Bread. Bread. Salmon? And bread. Though I do draw the line somewhere. That time he sat on a toy truck and went into a downward-facing dog position so that Mama could kiss it? Sorry. Not happening, buddy. Today, I don’t feel any more prepared than I did two years ago. I still can’t believe the hospital let us leave with a baby when we literally had NO FREAKING IDEA WHAT WE WERE DOING. I still feel the weight of responsibility when I remember we’re literally raising a little human. But I learned, my love grew, and that squishy baby is becoming his own little person. Sometimes he pushes my hand away. Sometimes he runs into the safety of my arms. He desperately needs me but is also learning how to navigate the world on his own. My love will always be unconditional (thank goodness, because I hear the high school years can be a doozy #hormones), but it’s growing into something deeper based on who he is. He loves the dairy. He is obsessed with books. He is polite and appreciative. He has boundless energy. He knows the names of more pieces of heavy equipment than I do (what the heck is a motor grader?). He is pretty sure we should have bread salad with bread casserole and roasted bread on the side every night (and bread cake for dessert). You guys. This kid is the absolute coolest. He makes us laugh every day. We are so grateful that God has entrusted him into our care. I can’t wait for the next year. I can’t wait to see how Anders continues to grow more uniquely himself. I can’t wait for the twos, even if there’s a side of terrible thrown in. Because I know my heart will be right there, growing alongside him. 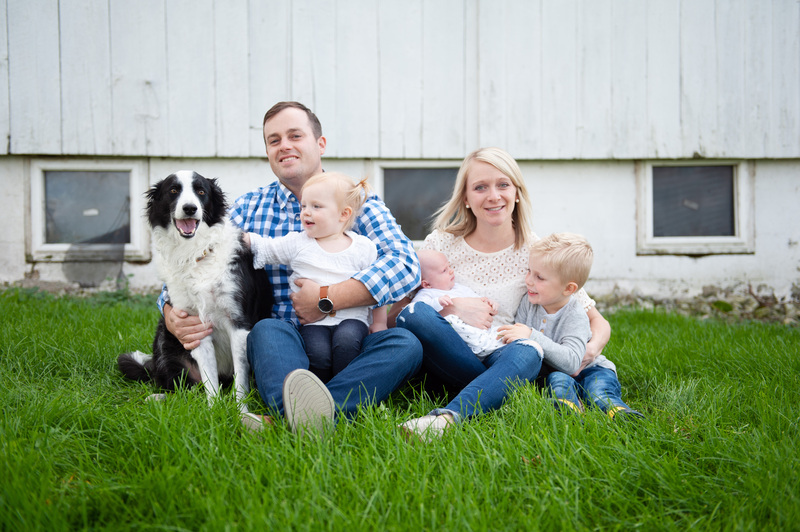 Next Post Our Farm …er… Family is Growing! Haha, so I guess you haven’t started talking weather/politics to him? Great post, he is adorable. Not yet! Thank goodness we can talk about cows. And thanks! You two are wonderful parents! God bless you every step of the way. Thank you for a delightful Taco Party!